Looking for the perfect eco-friendly gift for a friend or a loved one? Turn "one man's junk" into "another man's treasure" by reusing, recycling and reclaiming products that may otherwise end up in a landfill somewhere. It's amazing what beautiful and unique designs and products can be made from castaways! 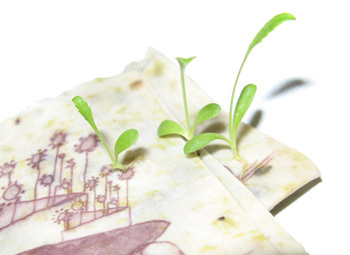 Plantable paper is one of the coolest ideas to come out of the green movement. Rather than throwing a piece of paper into your garbage bin (gasp!) or even into your recycling box, the idea is you plant it instead (hence the name of course) and get some lovely buds in return. If you're intrigued by the idea of seed paper, try making your own! It's a great idea for those seeking unique, eco-friendly cards, invitations, thank you notes, tags, bookmarks, labels and anything else your creative imagination can think up! Learn how to make your own plantable paper! Even those who live in small spaces can still experience the joy of nurturing, growing and harvesting a beautiful garden. 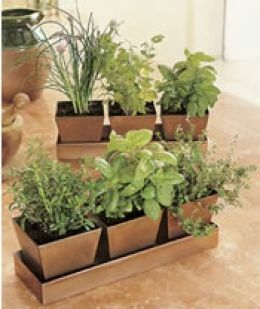 Create a garden kit that is easy to grow indoors any time of the year, or outdoors during spring and summer. This is project you can put together for a Spring birthday, Mothers Day or just for a thank you. You can tailor each kit according to your recipient's personal preferences, and it really is the gift that keeps on giving! Most gardeners like seeds. If you collected seeds from your garden this year, then you've probably got a few spares to give away. Or, if you have a good nursery in your area, you can buy some exotic or heirloom seeds. Make your seeds unique by designing your own packages. Use nice paper, photos, tiny money envelopes, drawings, cut outs from old seed catalogs, or design them on your computer and print them out. Make new plants with cuttings from your favorite plant for the plant-lovers on your list! They are almost totally free - all you have to buy is a container to plant them in. Get them started ahead of time in a decorative planter so they will be established and healthy before the recipient takes them home. When giving to beginners be sure to include instructions and choose easy care plants. Put together your own green gift baskets! Often, items that you'd find in typical gift stores or gift baskets might be made with harsh chemicals, or be crafted from materials that are not environmentally sound. By making or choosing your own components, you can be sure that you're not getting items that harm the ecosystem, and you're giving gifts that are better for both the recipient and the whole world. An added bonus – most green bath and cleaning items are also less harsh, meaning that these gifts can be welcomed by even the most sensitive of individuals!